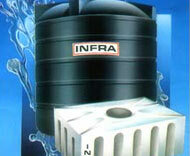 Plastic water tanks have emerged as an alternative for RCC water tanks for a long time. 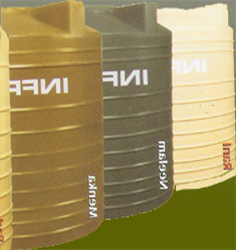 Available in various colors and sizes these plastic tanks are a boon during water shortage. Food Grade Safe - Plastic water tanks confirm internationally recognized FDA norms and is best suitable for storage drinking water. UV Protection , Prevention Algae – Manufactured with world class virgin poly ethylene, helps to resist UV rays and discourage growth of algae thus ensuring maximum protection to potable water. Leak proof and zero rusting – A single piece seamless construction makes it strong and leak proof. Complete polyethylene body ensures zero rusting and long usage period. Quick inspection and Easy Maintenance – White layer inside enables quick inspection of water quality and level with sizeable manhole for easy maintenance.